Calliandra is a large genus of tropical plants that consists of about 200 species of small trees and evergreen, flowering shrubs. 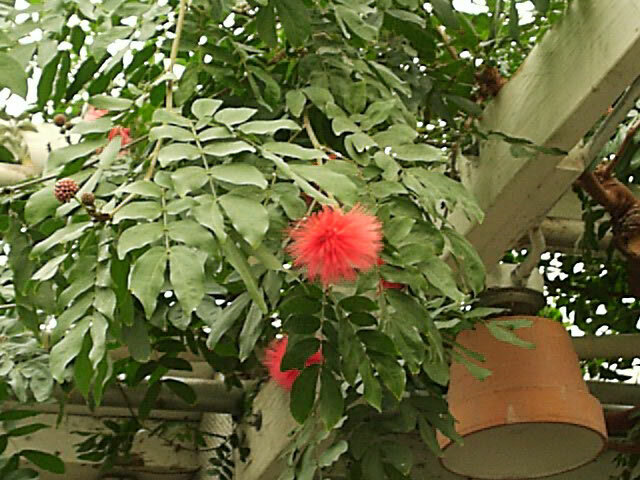 Calliandra haematocephala, commonly known as the Powder Puff Tree, is native to South America. 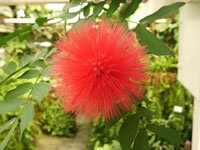 Powder Puffs grow up to 10 feet tall with an equal spread, but dwarf, 3-6 foot varieties are also available. Dwarf hybrids are more appropriate in colder regions where you will need to over-winter your plant indoors. Powder Puff Trees are primarily fall and winter blooming plants, especially in warmer climates, but they may bloom sporadically throughout the year if they are happy. They have bipinnately compound, 2" leaves that emerge as a flushed pink color but mature to dark green. Their oblong shaped leaves fold up to 'sleep' at night. In the fall and winter, your Powder Puff tree will produce lots of slightly fragrant, showy, 3" spherical flower heads consisting of hundreds of red, pink or white stamens that are attractive to both butterflies and hummingbirds. Powder Puff Trees are only hardy in USDA zones 10-12. In colder regions, they should be grown in planters which can be moved indoors during the winter months. but they tolerate some partial shade, especially in hot summer regions. They should be planted in reasonably fertile, moist but well-drained soil with a pH of 6.0-7.5.
to maintain evenly moist soil, especially during the summer growing season. Continuously wet conditions should always be avoided. Powder Puff trees can be kept to a smaller size by a yearly trimming after flowering is over in the spring. They should be primarily pruned to maintain shape and a dense form. Powder Puff trees are susceptible to damage from aphids, mealybugs and spider mites. If you live in an area where the Powder Puff tree isn't hardy, you will have to grow it in a large planter and move it back indoors during the winter. If space in your home is limited, you should consider growing a dwarf variety of the Powderpuff tree, which can be easily managed as a 2-3 foot plant by careful pruning. 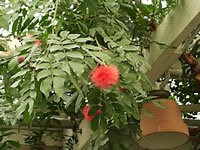 Indoors, Calliandra haematocephala needs bright light to full sun, fairly high humidity and an average room temperature of 60°-75°. If the lack of humidity is a problem, you can set the planter on a tray filled with moistened pebbles. Powder Puff trees can be grown in any good, commercial potting soil as long as it drains well. When repotting becomes necessary, the new planter should be only slightly larger. Repotting should be done in the spring. using a half strength solution of a balanced, all-purpose fertilizer. Check regularly for spider mite infestations. Powder Puff trees are easy to grow from seeds started indoors in the spring. and allow them to soak for 24-48 hours. which takes from 1-3 weeks. taken during the spring months. Dust each cut with a rooting hormone and strike into a peat moss/perlite mix at 75° until the cuttings are well rooted.